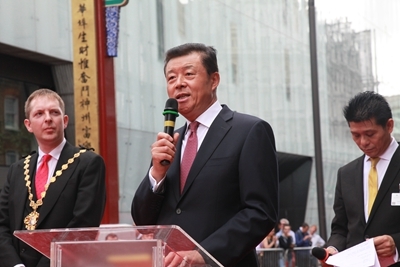 It is a great delight for me to join Your Royal Highness and all of you today in celebrating the completion of the new Chinese Gate in London Chinatown. On behalf of the Chinese Embassy, let me begin by extending warm congratulations and sincere appreciation to the London Chinatown Chinese Association, China Taiping, and other sponsors. You have made tremendous efforts and contributions to create this new gate. This gate is typical of many found across China. It reflects highly distinctive Chinese architecture that goes back many millennia. There are all rich details and cultural symbols. They are mostly found in front of palaces, temples and gardens or at the entrance to major streets. Everywhere these magnificent gates honour the place where they stand. "What is unique to a nation is precious for the world." · It is more than an architecture with Chinese features. 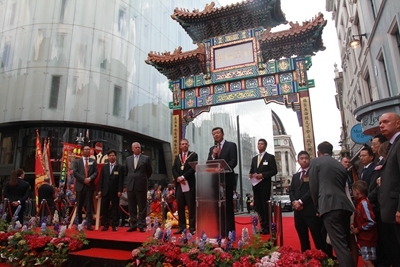 · It is a monument to the unity and indomitable spirit of the Chinese community in the UK. · It is a symbol of their hospitality and kindness. · It is a reflection of their perseverance, hard work and social commitment. · It stands for their aspiration for harmony, peace and prosperity - not only in London Chinatown - but also for all the Chinese communities across Britain. · The construction of the gate is symbolic of the collaboration of our two nations. It had the assistance and support of relevant Chinese and British authorities. They are, respectively, China's Overseas Chinese Affairs Office of the State Council and the government of London and Westminster. · Today, His Royal Highness is joining us to witness this event. This is yet another example of the great support from the British Royal family to China-UK relations. · The Gate is symbolic of how China and the UK reach out to each other and greatly value the importance of building friendship. Last year, President Xi Jinping paid a "Super State Visit" to Britain. During the visit, our two countries agreed to build a global comprehensive strategic partnership for the 21st century. And that visit opened the "Golden Era" of our bilateral relations. At present, exchanges and cooperation between China and the UK are flourishing in the political, economic, cultural and many other fields. It is my sincere hope and firm belief that the momentum in China-UK relations will remain strong and unaffected by the Brexit referendum or the change of the British government. It is my sincere wish that China-UK relations will grow even stronger. Just as this gate will always stand tall and firm, whatever the elements, through sun, rain and wind. In conclusion, I wish everyone who walks through this gate good health, happiness and success!